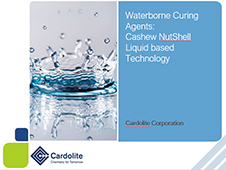 Cardolite® NX-­8401 is a solvent-free, low viscosity, epoxy curing agent by Cardolite. It is based on latest modified CNSL (cashew nut shell liquid) waterborne technology. It is supplied in water. It provides excellent compatibility with epoxy dispersions. It offers excellent adhesion to various substrates and very long pot life with improved flexibility. Cardolite® NX-­8401 is recommended for tile grout and adhesive formulations. Recommended dosage level of the grade is 107-152 phr.